Christmas in Review is now online! Christmas in Review is online now! I have recently been released from hospital following my surgery and I want to provide an update on my status to the CWM. Those of you on Facebook will recognize this as substantially a post I made on Monday evening. Hopefully for at least a few of you this is "news." I had triple-bypass heart surgery on Wednesday, January 4, at the Mazankowski Alberta Heart Institute, part of the University of Alberta Hospitals in Edmonton. I was in coronary intensive care through the following day, before being transferred to the "regular" coronary surgery recovery area. I did have one "blip" on that first day. I had trouble breathing and I was finally diagnosed with a partially collapsed lung. This required the insertion of a tube through my ribs into my lung cavity to prevent further collapse and to facilitate recovery. This worked just as it was supposed to. However, it probably cost me an extra two days of hospital time. The staff had me up and walking a short distance the morning after I arrived in the regular recovery unit (2nd day after surgery). I was encouraged to walk several times each day and walk a bit further each time. Although I would not have believed it on day 1 after surgery, I was ready to go home by day 7. I was discharged late in the afternoon of Wednesday, January 11. Since being home I have simply got stronger and more physically able each day. Yesterday (Sunday) Marian and I walked 1.5 km around my neighborhood. No marathon running in sight just yet, but the walking is coming along very well! There is still a long road of recovery ahead. By the time you read this, I will have had a follow up appointment with my family doctor on Tuesday. I can't drive for at least 6 weeks after surgery. I am off work until at least the middle of February, perhaps longer. Pain is still being managed, but is getting noticeably better. And I am now the proud owner of healing scars in my left leg from which the three by-pass veins were taken to be turned into arteries on my heart, plus a pretty good "cut-on-the-dotted-line" scar along my sternum where the serious business took place. Just thinking of what that surgery actually entailed on and inside my body still makes me a bit emotional to say the least! I need to express my appreciation to the Community of Christ for the support I have received all through this process. This includes the expressions of prayerful support that have come from so many of you from CWM congregations and members in so many ways. It includes the support of the church as my employer (particularly Art Smith and Dar Shepherdson) and the support of the mission centre staff (Debra, Lisa, Parker - and of Darrell Belrose filling in as interim Mission Centre President). Support has also come from many areas of the church well beyond CWM and it is all very much appreciated. Although I am getting back on the computer a bit more each day, I am certainly not yet "working." I welcome messages via email or Facebook (or good old fashioned snail mail! ), but I will not promise any kind of extensive response to them at this time. Thank you so much, again, to all of you who have offered thoughts and prayers of support for me and for my family throughout this process. I cannot tell you how much it has been appreciated. God bless all of you ... and I wish you all as Happy a New Year as I am having! Happy 80th Birthday Carl Bolger! There were close to 30 people (friends, relatives, Carl’s Church family) who gathered for Carl’s 80th birthday. Carl thought only a few friends were to join him for dinner, but we were there waiting. As he arrived we screamed “Happy Birthday” and “Surprise” and Carl was indeed surprised. He was attempting to digest this information when his phone rang and it was his brother saying how sorry he was that he couldn’t make it but he had work in Ontario. Carl said – “that’s fine as I am surprised by who is already at my birthday function”. Then brother Doug Bolger (from Ontario) walks into the room still talking to Carl on the phone! It was a major surprise. Everyone enjoyed Chinese food followed by cake. The ladies choosing the white cake and it seemed most men opting for the chocolate cake. Carl and brother Doug both told a comical story. Carl – who says he was totally surprised, thanked everyone for coming. Mark your calendars … the 2017 CWM Youth Retreat will be in Edmonton from Friday, February 17, 7:30 pm to Monday, February 20, 11:30 am. Online registration CWM_Youth_Retreat_Registration please register early. Women’s Retreat in Medicine Hat! As a part of our spiritual practice this year at the Nurturing Spirit Retreat, we will be offering an opportunity to focus on the blessing of giving and receiving food in community. As a child I was captivated by the story of a hungry crowd, some fish, 5 loaves of bread and Jesus. Shelby too, counts this as her favourite Bible miracle. But what really happened? Today I still wonder what it takes to make food sacred. Why do I feel so special when I take in the bread and the juice of communion? Why does food taste different on holidays or with special friends? What can we do as cooks at an event like NSR to bring the Spirit not just calories to the table? And, what makes Reunion cooks so awesome? And how do people turn into cooks? It must be something like the loaves and fishes, a little sharing, a lot of love, and a willingness to step up and be seen. If you are youth and are curious about cooking, learning about the Samish kitchen, curious about God and Spirit, and the really cool relationship between them, consider spending a week end in service at Nurturing Spirit. Get in touch with Debra or Lana. Youth Spirit Kitchen spaces are by donation, are limited and we have 2 registered already! And, no we won’t be dividing up fish, its vegetarian all the way! 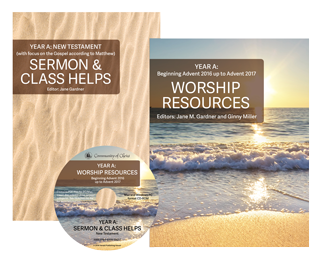 Again this year, Worship Resources is a two-book set. This book contains suggestions for worship planning for Advent 2016 up to Advent 2017. Weekly worship outlines include Community of Christ worship themes, lectionary-based scriptures, ways to engage all ages, recommended hymns from Community of Christ Sings, drama scripts and responsive readings, special prayers, focus moments, worship settings, and more. This book contains sermon and class helps based on focus scriptures listed in the Revised Common Lectionary for Sundays and special liturgical days with emphasis on the New Testament, particularly on the Gospel according to Matthew. Each sermon help includes Exploring the Scripture, an exegesis of the text including critical interpretation of the context, people, and events described in the featured scripture passage. Sections called Central Ideas and Questions for the Speaker contain suggestions for a sermon thesis and questions to help the preacher frame the ideas. Order online today at Herald House.